Before I post up this week’s drawing, I must apologize to all of your readers out there. I’m sorry that I did not have a post up last week. During then, I was in Texas and had forgotten to set up a post through the WordPress.com platform. But I digress. 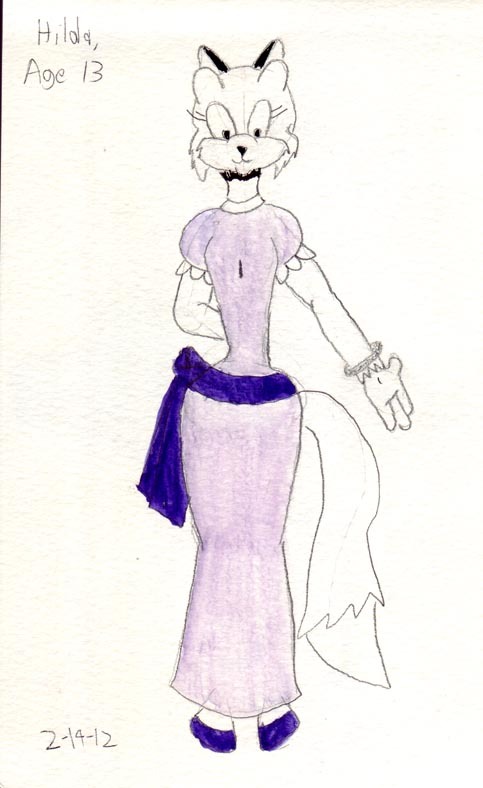 Last week, I showed an image of Hilda Otejekker, my wealthy heiress, as a little girl. How about an image of her as a teenager? Another one from the sketchbook done in pencil, ink and watercolor. This is Hilda Otejekker at the age of 13. She’s entering her adolescence. This should be apparent by her, um, curves starting to show. Her hips are getting wider now. 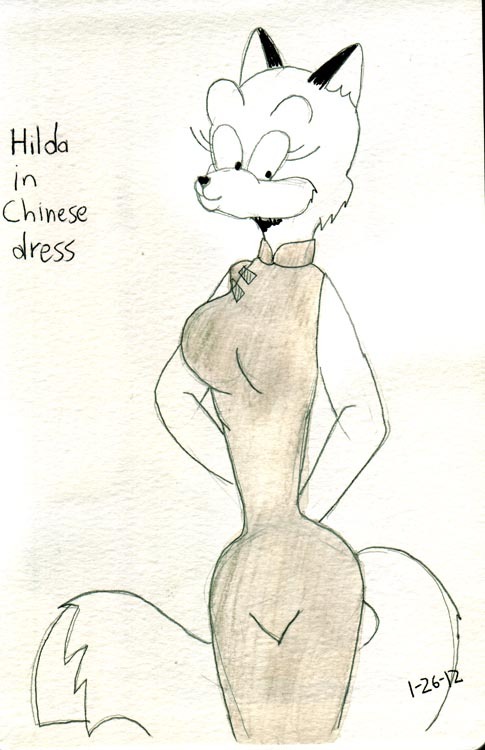 At this age, Hilda still liked to have fun, especially listening and dancing to jazz and rockabilly music. However, she was also taught much about money and how to manage it by her rich parents. I’ll have another drawing up next week. Hilda Otejekker practically grew up in luxury. Her parents were very rich so they bought her only the best clothing that money could get. 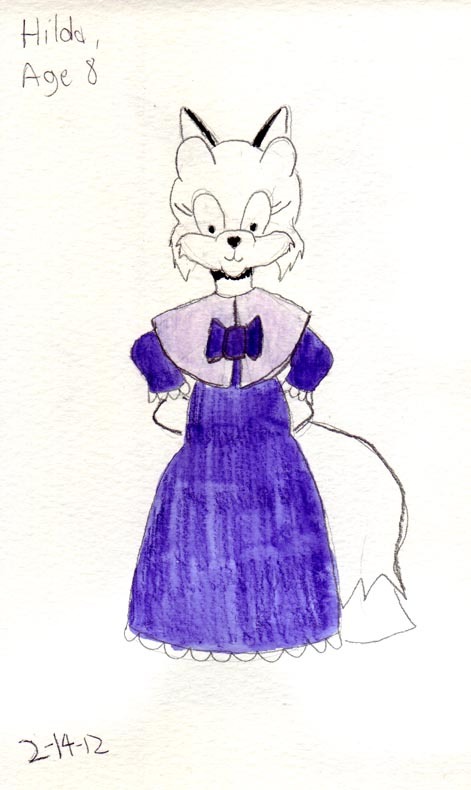 This watercolor sketch depicts Hilda as a little girl at the age of 8. I got quite a few comments on the dress here. This dress is quite fancy with its frilly edges. It was chiefly based on some of my research into women’s fashions of the Late Victorian and Edwardian era. Sketched with pencil, ink and watercolor, this came out better than I expected. Here’s another one from the watercolor sketchbook. Hilda may be only twenty years of age, but she has ALOT of wealth. She has many expensive dresses and other outfits. Among her favorites are a whole bunch of Chinese dresses. She’ll wear them when she and Richie go out on the town. This was done with pencil, pen and diluted watercolors.